The right golf shaft can give you more distance and accuracy. The shafts of your irons definitely can be too flexible. So can the shafts of hybrids, fairway metals and drivers. Yet the very shafts that are too flexible for you might be too stiff for another player. The flexibility of the shafts you should be playing is linked to your swing speed. If your swing speed is fast -- pros blast the club through the hitting area at more than 100 mph -- a normal shaft will be too whippy for you. Moreover, your control will be erratic and you will be prone to nasty duck hooks. The most flexible shafts are designed for people with swing speeds of less than 70 mph. Golfers with ultra-slow swing speeds are best suited for what is termed a flexible, or "L" shaft, which can help them reach the upper limits of their distance capabilities. LPGA Tour players who hit their drives 275 yards usually use regular or stiff shafts, while older men with very slow and weak swings are advised to use flexible or senior shafts. After the "L" shafts, the next-most flexible classification is the senior shaft, also called an "A" or "M" shaft, which is designed for swing speeds of 70 to 85 mph . Thereafter, the degree of stiffness increases to regular shafts, stiff shafts -- and extra stiff shafts for those. These are general guidelines, as there are no uniform shaft standards among manufacturers. As recently as the turn of the 21st century, most golfers played with shafts that were too stiff. If the shafts on an iron is too stiff, it can almost feel as if you are swinging a telephone pole. 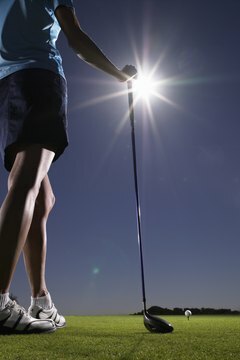 It also will be hard to square the clubhead at impact, meaning you will have a tendency to hit your shots to the right. "Play the most flexible shaft you can control," said Scott Hennessey, president of True Temper shafts. "If it's too soft, you'll spray the ball all over the place." Raw swing speed is not the only factor in determining the best shaft for you. Tempo, shaft length and ball flight count as well. The best way to avoid buying clubs with shafts that are too flexible -- or not flexible enough -- is to be properly fitted by a club-fitting expert.